by Glickman, Carl D.; Gordon, Stephen P.; Ross-Gordon, Jovita M.
This brief version of Glickman, Gordon, and Ross-Gordon's SuperVision and Instructional Leadership: A Developmental Approachcontinues to break new ground by exploring, challenging, and reshaping the field of educational administration. A valuable resource for both aspiring and practicing school leaders, this book is a necessity for any school leader's library. 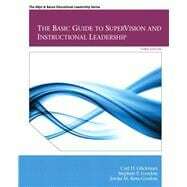 SuperVision: A New Name for a New Paradigm. Supervisory Glue as a Metaphor for Success. The Work Environment or Culture of Schools. The Legacy of the One-Room Schoolhouse. Blaming the Victim and Structural Strain. Viewing School Culture in the Context of the Larger Culture. Background to School Effectiveness Studies. The Second Wave of Effective Schools Research. Context Studies in Effective Schools Research. Has Effective Schools Research Outlived Its Usefulness? The Legacy of Effective Schools Research. From Effective Schools to School Improvement. Connecting School Improvement to the Local Community and Larger Society. What to Do with Successful Schools Research: Some Propositions. 5. Reflections on Schools, Teaching, and Supervision. Effective and Good Schools: The Same? Instructional Improvement and Effective Teaching. Supervisory Platform as Related to Educational Philosophy. Checking Your Own Educational Philosophy and Supervisory Beliefs. What Does Your Belief Mean in Terms of Supervisor and Teacher Responsibility? Comparing Self-Perceptions with Other Perceptions. A History of Overreliance on Control. When to Use Directive Control Behaviors. Moving from Directive Control toward Directive Informational Behaviors. Comparing Directive Control and Directive Informational Statements. When to Use Directive Informational Behaviors. Moving from Directive Informational toward Collaborative Behaviors. When to Use Collaborative Behaviors. Moving from Collaborative toward Nondirective Behaviors. Nondirective, Not Laissez Faire, Supervision. When to Use Nondirective Behaviors. Not Algorithms, But Guideposts for Decisions. Scenario and Discussion: Inappropriate Use of Interpersonal Behaviors? Assessing and Planning within the Organization. Formative Observation Instruments Are Not Summative Evaluation Instruments. Types and Purposes of Observations. Comparing Clinical Supervision with Teacher Evaluation. Integrating Clinical Supervision and Developmental Supervision. Dimensions of an Effective Group. Characteristics of Successful Professional Development Programs. Integrating Schoolwide, Group, and Individual Professional Development. Examples of Effective Professional Development Programs. Teachers as Objects or Agents in Professional Development. Curriculum Development as a Vehicle for Enhancing Collective Thinking About Instruction. What Should Be the Purpose of the Curriculum? What Should Be the Content of the Curriculum? How Should the Curriculum Be Organized? In What Format Should the Curriculum Be Written? Curriculum Format as Reflective of Choice Given to Teachers. Relationship of Curriculum Purpose, Content, Organization, and Format. Levels of Teacher Involvement in Curriculum Development. Integrating Curriculum Format with Developers and Levels of Development. Matching Curriculum Development with Teacher Development. How Is Action Research Conducted? A Developmental Approach to Action Research. Action Research: Vehicle for a Cause beyond Oneself. Shared Governance for Action Research. Suggestions for Assisting Action Research. Conclusion: Focus, Structure, and Time for Development. A Societal or a School Problem? Appendix A: Review of Interpersonal Behavior in Four Supervisory Approaches.